Get your head into Infinity War! Hero Vision tech puts kids inside a digital world where they AR The Hero. It’s an awesome, immersive experience that lets kids see through the hero’s eyes, enter their world, and harness their inner power. Battle like Iron Man with the Hero Vision Iron Man Augmented Reality Experience! This movie-inspired, 1:1 scale mask features a brand-new experience from Hasbro that combines traditional role play with Augmented Reality (AR) technology. Download the HERO VISION app, place a compatible device (see apps.hasbro.com for compatibility) inside the AR goggles, place AR markers around the play area, put on the AR mask, and then get ready to see digital images from the hero’s world in front of kids’ eyes. Collect Infinity Stones sold separately with 6-inch figures to unlock power-ups in the Hero Vision app (after 3/3/18). Includes AR mask, AR goggles, gauntlet, three AR markers, and one Infinity Stone. See the action through the eyes of Iron Man with Hero Vision! AR you ready? 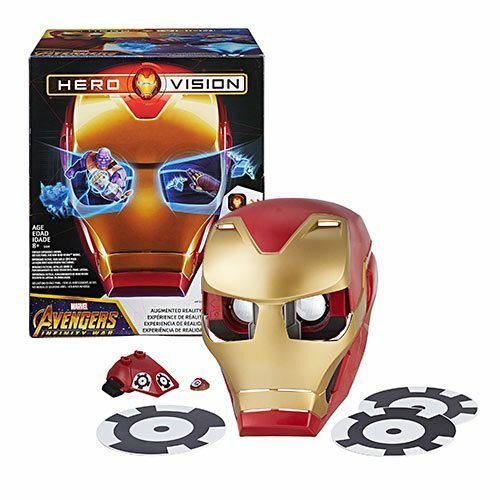 Includes Hero Vision Iron Man AR mask, AR goggles, gauntlet, 3 AR markers, Infinity Stone, and instructions. Ages 8 and up.